Optional compatible cartridge, which does not come in the product box. Approx. 7.4 ipm / 15 sec. Approx. 4.0 ipm / 23 sec. Approx. 4.0 ipm / 29 sec. PRINT RESOLUTION /DROPLET SIZE MIN. Canon’s Full HD Movie Print feature. copying and faxing of multipage double-sided documents. how much ink is remaining. when the ink is running out. developed to meet these exacting standards, print after print. easier than ever to get efficient. inks guarantee the performance levels you expect from your PIXMA. 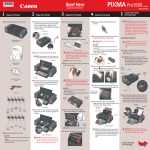 With a Canon PIXMA, ink is the lifeblood of everything you create. those that last a lifetime. wherever you choose to be. adaptor and get speedy document or photo prints on the move.